SALEM, Mass. – A video showing a little girl with pigtails screaming at a street preacher to ‘shut up’ as she relentlessly mocked him and his message of redemption through Jesus Christ has gone viral. The video posted on Live Leak, which has been viewed more than 250,000 times, shows a child approaching Austin Coppock, who had been preaching on Salem’s busy Essex Street pedestrian mall during the city’s annual Halloween celebration. Salem, which is also known as “The Witch City” and where police uniforms and patrol cars are even marked with the slogan and an image of a witch on a broom, hosts an annual event attracting tens of thousands of people to the city streets. This year police estimated upwards of nearly 100,000 people visiting the city for the annual celebration. The city was the location of the Salem Witch Trials of 1692 and has a long history of witchcraft and paganism that continues to this day. Because of Salem’s roots, the city hosts the month-long celebration called “Haunted Happenings,” which includes a costume parade, witch-centered dramas, psychic readings, public fairs and carnivals. A number of occult shops are especially visible during the month of October and the mockery of Christianity is commonplace within the city as some festival-goers dress in blasphemous costumes, mocking Jesus Christ and His crucifixion. The event also attracts some local Christians and others from different parts of the country who seek to reach out to the lost through distributing gospel tracts, engaging in one-on-one discussion and publicly preaching the gospel of Jesus Christ. Coppock, from Dalton, Georgia, continued to calmly proclaim to passersby to turn from sin and to turn to God through Jesus Christ. Upon the mentioning of the Lord, the unruly child began to mock the name of Jesus. Despite the girl’s repeated attempts to disrupt him, Coppock remained unfazed and continued preaching. Coppock told Christian News Network that the Lord saved him two years ago after heading down a dark road in rejection of Christ and His Church. After being born again, he said that he knew “without a doubt” that God led him to Salem to preach to the thousands of Halloween revelers in the hope that some would come to repentance and believe the gospel of Jesus Christ. He said that the mother of the girl who yelled at him to “shut up” was “standing in the background, laughing and smiling as if she was proud her child was mocking” Christianity. He said that he did not know why the cameraman was recording, nor his motives in posting the video online. “He records us every time we go out to preach, only posting up certain sections of his recordings such as this video,” Coppock noted. Salem, however, is no stranger to targeting street preachers, which is seen as a threat to the city’s annual celebration of death and darkness. 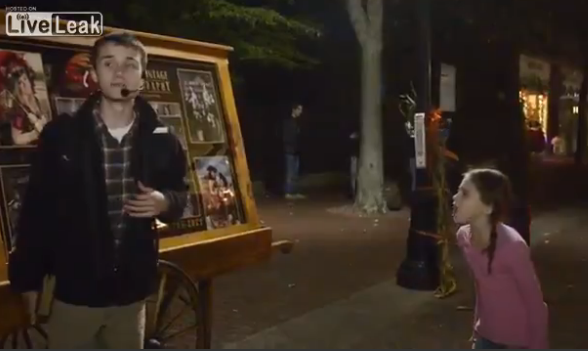 Last year, Phil Wyman, who refers to himself as a “spiritual adventurer” and “modern mystic” and runs the annual Halloween event’s entertainment, along with a “confessional booth” and “dream interpretation” tent, targeted the street preachers. During an interview on “Live From the Bay,” Wyman explained that it is his custom to send men dressed in monk costumes to chastise street preachers and put distance between them and the area witches. Wyman was expelled several years ago from the “International Church of the Foursquare Gospel” for forming too close of relationships to the area witches. Immediately following last year’s Halloween festival, local revelers demanded that city officials work to prevent the street preaching by cutting off their amplification so as to not to be heard above the din of all the noise and commotion. The city council did pass an ordinance banning its use during certain day hours, but realized an outright ban would also free speech rights for all, including the entertainers and musicians that are also in town for the event. The bizarre and anti-Christian behavior isn’t limited to the city’s Halloween festival, however. Less than three weeks before Halloween this year, police arrested Brian Thomas Bennett of Beverly, Mass. after stunned onlookers watched him dig up a mid-1700’s historic grave in broad daylight. Bennett was stopped just after uncovering the top of what police believed to be a crypt and was ultimately charged with desecrating a place of burial and disorderly conduct. He was also wanted on an outstanding warrant. Salem Mayor Kimberly Driscoll also recently cut the city’s contract with Gordon College in managing Old Town Hall because of the college’s behavioral standards policy that prohibits staff and students from engaging in homosexual behavior. The policy likewise forbids fornication, drunkenness, profanity, blasphemy, lying and other behaviors that are contrary to biblical law. “I hope you realize how hurtful and offensive these ‘behavioral standards’ are to members of the greater Salem LGBT community, some of whom are Gordon alumni, staff and/or students,” Driscoll wrote in a letter condemning the school. As for Coppock, he says he will keep preaching the message of repentance and faith in Jesus Christ, His death, burial and resurrection as the Lord directs him.